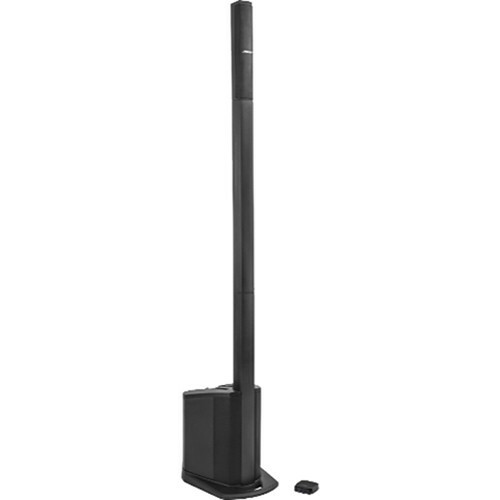 The Bose L1 Compact Wireless is a portable line array system designed to provide wide coverage, wired and wireless connectivity, and simple setup for musicians, DJs, and hosts at restaurants, parties, conferences, and other special events. It features proprietary technology and multiple drivers to deliver nearly 180° of coverage for audiences of up to 100 people. Wi-Fi and Bluetooth capabilities are provided by the included SoundTouch Wireless Link adapter, which connects via a supplied audio cable to the L1. The system uses interlocking components that require no cables or stands. It sits at 16.5” high and has two 32.5” extensions for an extended height of 78.5”. XLR, RCA, 3.5mm, and 1/4” inputs allow you to connect a variety of sources such as a microphone, guitar, smartphone, and CD player. The built-in mixer offers controls for volume, treble, and bass, plus ToneMatch presets further enhance your tone. 1/4” and RCA outputs can easily be connected to a recorder or another L1 system. The L1 Compact Wireless can be carried in a single trip due to its built-in handle and supplied carry bag for the extensions. The Bose L1 Compact Audio PA System delivers the audio fidelity expected from Bose in a sleek, lightweight and portable unit that's ideally suited for travelling musicians, presenters, mobile DJs, and for lectures, worship, etc. The L1 features a 2-channel mixer amplifier that also serves as the speaker's base. The mixer features an XLR microphone input, RCA line input, 1/8" mini line input and 1/4" phone input that may be switched to accept line or instrument signals. Six small drivers are carefully positioned into the compact speaker to ensure balanced audio signal at the direct and off-axis (sides) of the L1. Setting up the L1 is quick and easy; simply place the speaker extensions into the amplifier base, and slide the speaker on top of the extensions. Two extensions are included, and allow easy height adjustment. Six small drivers mounted at precise angles inside a slim, vertical enclosure. This proprietary Bose technology delivers nearly 180 degrees of horizontal sound coverage. Sound remains consistent even at extreme sides of the system. The power stand / mixer provides one microphone XLR input on channel 1; channel 2 has one instrument input, one RCA stereo input and one 1/8" stereo input. Both channels have two-stage clip lights, volume controls and a customized ToneMatch preset. Rear panel has one 1/4" balanced line output and one RCA stereo output. The power stand / mixer delivers clean, precise amplification for L1 Compact loudspeaker and bass enclosure. Proprietary Bose technology enables the system to be positioned directly behind or to the side of a performer, eliminating the need for separate PA speakers, stage monitors and mixers. ToneMatch presets optimize the L1 Compact system for a dynamic handheld microphone (channel 1) or acoustic guitar (channel 2). With extended (78.5") and collapsed (16.5") positioning, you can tailor the system's sound coverage for the room or event. For larger audiences, use the included loudspeaker extensions to elevate the array. For smaller gatherings and meetings, leave the array in its slot on the power stand and place the system on a tabletop. The lightweight interlocking design makes the L1 very easy to transport, set up and break down. The power stand weighs just 25 pounds, and the total system with loudspeaker and extensions weighs 29 pounds. No speaker cables, stands or bass modules required. The entire system can be set up in a minute or less. Make nearly any speaker setup wireless with the Bose SoundTouch Wireless Link Adapter. It is equipped with Bluetooth connectivity to allow streaming from your compatible mobile device and Wi-Fi to access Internet-based content. Its 1/8" audio output will allow you to connect it to external speakers or a stereo system with the included 1/8" to RCA adapter cable. The 1/8" audio output also functions as a mini-optical output for connecting compatible digital equipment. SoundTouch gives you wireless access to your favorite music services like Spotify and Pandora, plus Internet radio stations and your stored music library. SoundTouch connects to your home Wi-Fi network so you can play music directly from the Internet to the system itself, or hear anything you want from a compatible smartphone or tablet with Bluetooth technology. SoundTouch systems feature Bluetooth connectivity to stream music from any compatible device whenever you want. This allows you to listen to even more sources, like YouTube. SoundTouch systems are made to grow with you. If you start with the SoundTouch Wireless Link for your stereo receiver, you can add more anytime. Sync all your SoundTouch devices together to play the same music in every room or different music in different rooms. The free SoundTouch app gives you control of your SoundTouch Wireless Link adapter from a compatible smartphone or tablet. Use it to browse and control music throughout your home. Start streaming instantly or use the app to personalize the presets to your favorite playlists and stations. Box Dimensions (LxWxH) 24.0 x 24.0 x 20.0"
Box Dimensions (LxWxH) 7.1 x 4.6 x 2.6"
What kind of mic to you use with this speaker?